A warm and humid evening saw thirty Roadrunners make the trip to the west of the county for this year’s Bury 5. 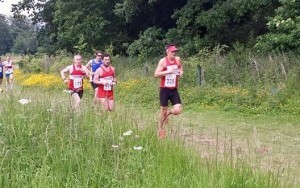 Despite the difficult conditions there were some very strong performances evident. The evening got off to a great start with thirteen year old Courtney Turner taking the third girl award in the U15 race. In the main event, determined running from Darren Cook and Mark Ford saw them both finish with a well deserved sub-31 time, and there was an impressive new personal best delivered by the in-form Marion Parker. Club legend Tim Finegan notched up an unbelievable 68th consecutive Friday 5 appearance, that’s over thirteen years of unbroken devotion to this terrific series! The quietly improving Lee Crisp also enjoyed a strong outing, delivering a sub-35 and appearing strong throughout. 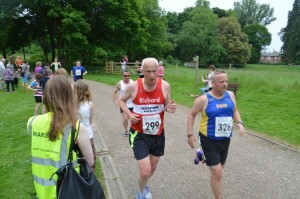 The race was won by Andrew Rooke of Aldershot, Farnham and District with a brisk sub-26, while the emerging star that is Danny Rock claimed fourth place in only his second five mile race in 28:30. 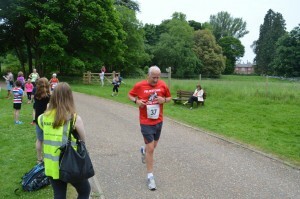 In fact he’d held third for a good while but was pipped to the line by the Pacer’s own Martin Gear. 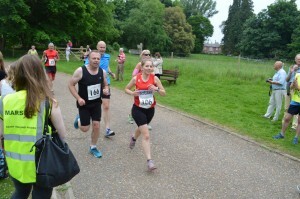 Other notable performances were the impressive Adam Howlett of Framlingham Flyers claiming a top 10 place and the MV40 crown with it, and the seemingly unstoppable, and very consistent Odette Robson of the host club taking first lady and only narrowly missing out on a sub-30. I’m sure the county will be hoping for kinder conditions for the fourth round of the series, taking place on 19th June at Haughley Park, Stowmarket. This one has the added spice of being part of the Suffolk Grand Prix series so athletes will be keen to deliver a strong performance.